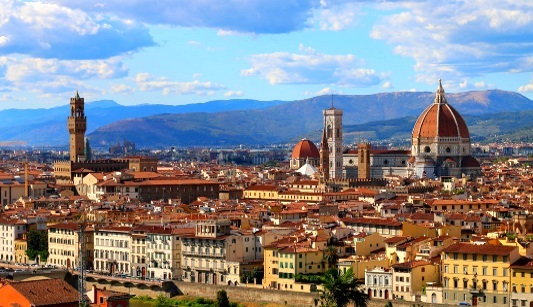 You must have seen these three sights in Florence: Florence is a city of great attractions. 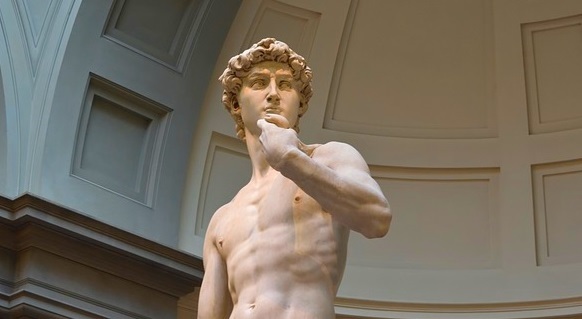 The two art museums Uffizi and Accademia belong to the TOP 10 museums in Europe. The Cathedral of Florence is one of the TOP 10 churches in the world. But there are many other great sights in the city in Tuscany for which you need an entrance ticket. These include without doubt the Palazzo Vecchio and Palazzo Pitti palaces. But also other museums as the Bargello are more than worth seeing. All these sights cost admission, some are even quite expensive. Moreover, there are very long queues at the cash desk at the big attractions. Therefore, it makes sense to buy entrance tickets in advance on the internet. Who wants to queue several hours at a queue while on holiday? At the Uffizi, the Gallerie Accademia and the ascent to the dome of the cathedral, the waiting times are often enormous. The queues at these entrances are often already hundreds of meters long in the early morning. Buy tickets online beforehand: How? Where? Buy tickets online: This is the trick to bypass the queues. In the meantime, a large number of Florence tourists buy tickets online beforehand. Almost all important tickets are available on the great website Getyourguide. Most tickets come with a free cancellation option. On Getyourguide.com there are many different offers, normal tickets, but also guided tours through the sights, city tours including visits to museums and much more. you are spoilt for choice. Here are some tickets for Florence that we recommend. You should buy the entrance tickets online in advance, especially in the season before, otherwise you will spend a larger part of the city trip to Florence in queues. In summer the waiting times are especially long. But we also waited 45 minutes for the Uffizi on a working day in January, in summer it is often several hours. In some cases, the internet tickets cost a few euros more than on site, but in our opinion this is much better than waiting for several hours. 1. 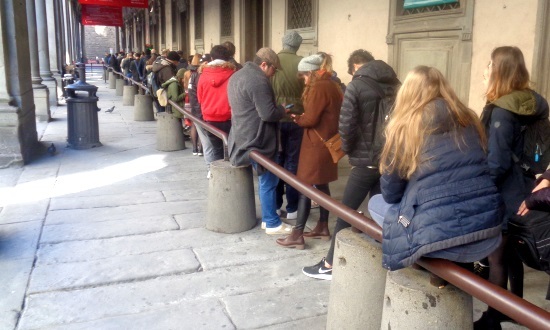 Tickets Art Museum Uffizi: The most important museum of Florence is notorious for its hundreds of meters long queues at the cash desk. Those who buy tickets on the Internet save long waiting times. 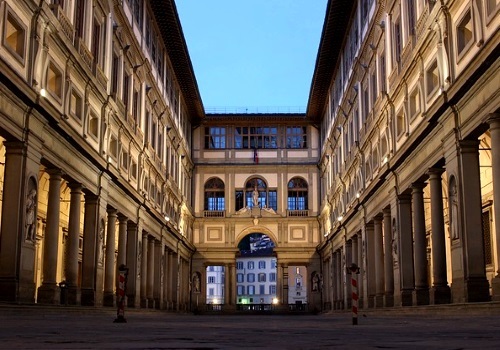 >>> On this link you can find the online tickets for the Uffizi. 3. Tickets Dom Florenz: Tickets for the cathedral can be bought on the spot. The problem with long waiting times is especially if you want to get to the famous dome. The ascent of the dome is for almost all tourists a highlight of a trip to Florence. The accesses are narrow, the access is limited. Many more people want to visit the dome in Florence than can. >>> On this link you can find the tickets for the cathedral dome in Florence. These are another 2 very important buildings and museums in Florence. Guided tours are also a very good idea in Florence. Even if you book a guided tour, you usually don’t have to queue in the long queue. A guided tour through a museum, a palace or the cathedral is much more informative than a visit alone, without museum experts. 7. Ascent to the dome of the cathedral: Every visitor of Florence should climb the world-famous, gigantic dome of the cathedral. The most famous dome in the world. But those who are afraid of heights or can walk badly should leave it alone. The tickets include a guided tour of the dome as well as a visit to the Cathedral with the Baptistery of Florence, the Cathedral Tower of Florence, the Cathedral Museum, etc. >>> On this link you can find the tickets with guided tour to the dome of Florence Cathedral.